Hope everyone had a great Mother’s Day weekend! Here are the latest social media news highlights for those busy last week taking care of last-minute Mother’s Day details. Facebook Adding Ad Menu Shortcut for Page Administrators: Facebook has begun to roll out a shortcut to the ads menu for Facebook page admins. The shortcut appears in the upper right side menu. Using this shortcut, admins can switch between the pages they manage and ad campaigns they are actively running. Facebook Introduces Audience Insights Tool: Facebook recently introduced a new tool, Audience Insights, to help page administrators better understand their existing and potential audience. Audience Insights provides aggregate information available through Facebook’s audience usage such as demographics, types of pages liked, frequency of Facebook usage, and more. Page administrators will have better insight into their current fan audience, the general Facebook audience, and custom segments of their fans. Language Targeting Now Available for Twitter Advertising: 20 languages are now available to Twitter users looking to better target Promoted Tweets or Accounts. 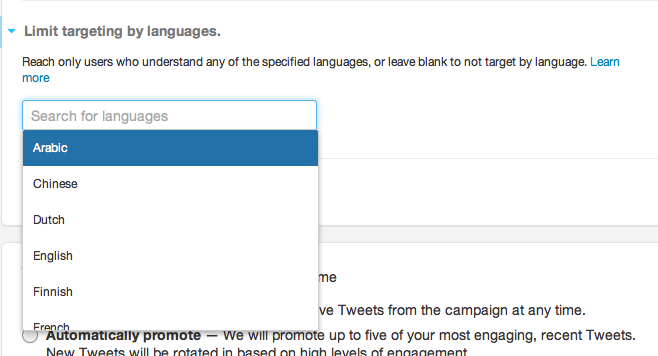 Language-specific analytics have also been added to gauge the effectiveness of multilingual Twitter ad campaigns.